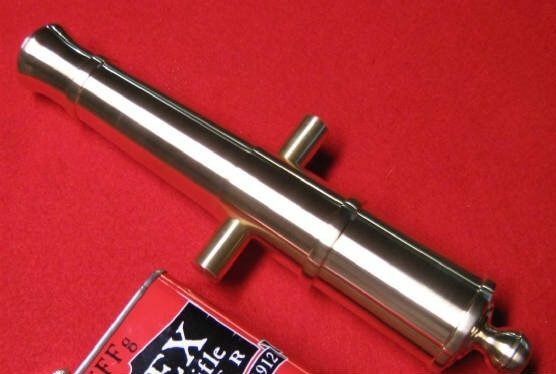 This is a very special Civil War Era Replica 32PDR Cannon Barrel machined of solid brass. This Brooks’ Golden Gun measures 12 1/2″ OAL, artistically machined from 2 1/4″ solid brass rod, with 5.8″ trunnions. Designed to meet and exceed industry safety standards as a black powder salute cannon. MADE TO SPEAK! It is a great black powder signal cannon. Express your talents and save money: ready for you to mount on your carriage. This is an outstanding value and is of excellent quality. MADE IN USA. As always, your satisfaction is guaranteed. This barrel is temporarily out of stock. Let us know if you are interested in our 50 or 69 caliber versions so we can get your order booked.